Dizziness is a broad term that is often used interchangeably with vertigo to describe a loss of balance, feeling feint, or lightheadedness. Confusion about the difference between these terms can make it hard for doctors to arrive at an accurate diagnosis of their patient's condition. 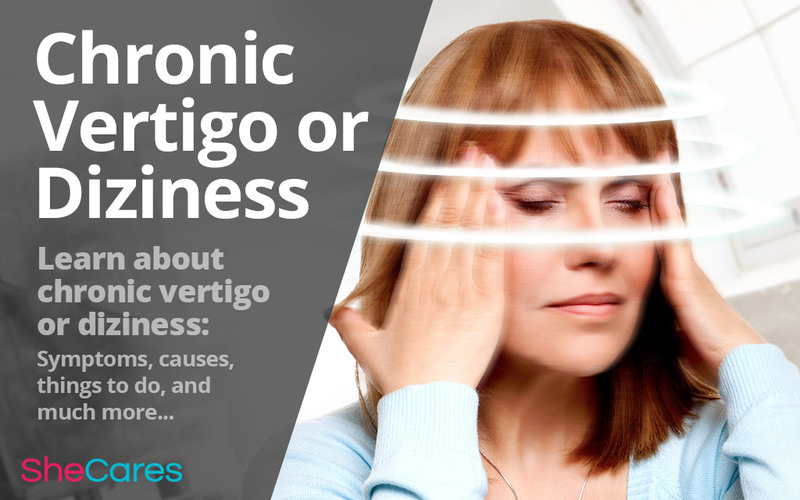 The general medical consensus is that vertigo refers to an illusion of movement - whether this be of the body or the surrounding area. This sensation can lead to feeling dizzy and even nausea. If this experience is recurrent, it is often referred to as chronic vertigo. You may feel worse when you move your head, change positions (i.e; stand up, roll over), cough, or sneeze. Some of the most commonly-seen conditions that can cause chronic dizziness or vertigo include the following. This condition is sometimes referred to as vestibular neuronitis. It occurs when the inner ear is infected and inflamed, which can cause loss of hearing as well as vertigo and problems with balance. If the relevant nerves come into contact with bacteria or a virus, they become inflamed, which will impact your center of balance. If the infection has been caused by bacteria, a prescription of antibiotics can be administered, which should defend against the spread and then cure the problem. This disease is believed to affect more women than men; however, it is not particularly common. Meniere's disease is a chronic condition rather than a temporary one. It can cause tinnitus (i.e., ringing sound in the ears), a sensation of pressure in the ears or head, and sometimes even permanent deafness. The periods of vertigo associated with this condition often last between 20 minutes and two hours, and their intensity can lead to nausea and even vomiting. There are injections and surgeries that can be administered to the ear, as well as lifestyle changes that can also improve your symptoms. BPV - sometimes called benign positional vertigo, positional vertigo, or postural vertigo - develops due to collections of calcium in the inner ear. The inner ear has fluid-filled tubes called semicircular canals. When you move, the fluid moves inside these tubes. The canals are very sensitive to any movement of the fluid. BPV occurs when a small piece of bone-like calcium breaks free and floats inside the tube. This sends confusing messages to your brain about your body's position. Chronic vertigo is typically brief in people with BPV, lasting only seconds to minutes. Unfortunately, some people are prone to migraines, which can be triggered by stress, light, and certain foods, or they may even occur for no apparent reason. Around one third of migraine sufferers are likely to experience balance problems - whether this be vertigo, dizziness, feeling off balance, or being extra sensitive to movement. The severity of these sensations will differ depending on the person, and they can occur before, during, or after the migraine itself. If you believe you may be suffering from one of these conditions, it is important to talk to your doctor about your concerns. Although there are not always lifelong cures available, there are many different coping methods that can be tried in order to relieve your symptoms. It is also possible that your chronic vertigo or dizziness is due to another condition entirely, a factor that can be thoroughly explored if necessary.